Lemala Mara is the ultimate seasonal camp in Serengeti, within touching distance of the Mara River and set under large Euclea trees in the heart of the best game viewing area of the Northern Serengeti. Here, in this immense remote wilderness, almost double the size of the Masai Mara, guests can enjoy fabulous landscapes and terrific game viewing with practically no crowds. Resident wildlife numbers are exceptionally high, with prides of lion up to 30 strong, but nothing compared to when the migration starts arriving from June onwards. The area then turns into a wildlife paradise par excellence. 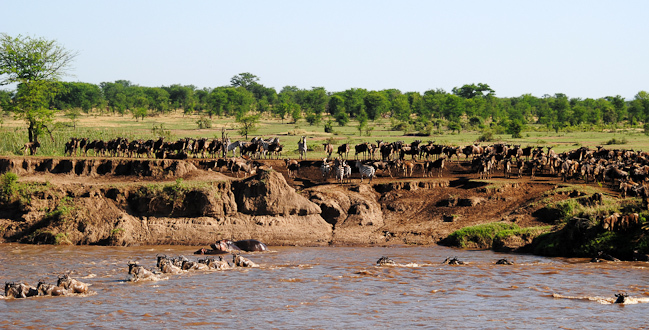 Through June, July and August the wildebeest continue moving through the area, crossing and re-crossing the Mara River before heading north towards the Masai Mara. Several large herds remain behind and weather changes could easily bring the vast herds flooding back into the area from the Mara. Migration and predator action lasts up to the end of October, assuring this area’s reputation as one of the finest wildlife areas in Africa. At the camp's superb location, Lemala guests will be amongst the vast herds of migrating wildebeest and zebra. Two of the largest crossing points on the river are nearby and occasionally guests may observe the exciting crossings from the comfort of the camp. The spectacular Lamai triangle, Wogakuria kopjes and Kogatende airstrip are all very easily accessible. Lemala Mara's naturalists/guides have exceptional local knowledge, enabling them to take guests to where the action is, in open 4x4 vehicles, away from the crowds. Lemala's vehicles are specifically designed for long game drives and come equipped with comfortable seats, charging units and a large refrigerator. The camp organizes great picnic breakfasts and lunches for those who want to go on full day game drives. Private vehicles can be booked in advance at extra cost and are subject to availability. The camp is open from 23 June to 31 October and has 11 luxury tents (accommodating 22 to 26 guests). The new high specification tents are some of the most spacious and comfortable seasonal tents in Tanzania. Each tent is fitted with 2 double beds or 1 king size leather bed, warm duvets, flush toilet, large safari shower, running water, wooden cabinets and flooring, 24-hour solar lighting, outside lounger, games table and much more. The mess tent offers separate living and dining areas with a central bar area and is beautifully decorated with leather sofas, chandeliers, side cabinets, rugs and chests. In the evening, guests gather around the campfire for sundowners before dining under chandeliers hosted by the camp manager. House alcoholic and non-alcoholic drinks are included at meal time. Without a doubt, Lemala Mara is an exceptional camp with an beautiful location offering a high quality safari experience with superb local guides. The camp can be booked on a private basis. Guests arriving in their own vehicles should also ideally spend 2 nights at Lemala Ewanjan Seronera Valley, a beautiful camp with stunning views. George Adamson, co-raiser of Elsa the lioness, and husband of "Born Free" author Joy Adamson, visited the Serengeti in the early sixties and describes the experience in "Pride and Joy", his autobiography. At this time he considered it probably the greatest of all game reserves in Africa and one man was mainly responsible - Bernhardt Grzimek, Director of Frankfurt Zoo. The Serengeti had suffered terribly from over-zealous hunting in the 1930's and from large-scale killing of game during the war. Grzimek applied himself to the tensions between Maasai need for grazing and the indigenous wildlife. He and his son carried out a massive survey, using planes to quantify the game, and identifying and logging the plantlife. He used his best-seller "Serengeti Shall Not Die" to raise funds and publicise the exercise. Thanks to the Grzimeks, and to John Owen who established a renowned scientific research establishment there, the Serengeti still has an amazing concentration of wildlife. The 14,763 square kilometres of the Serengeti are probably most famous for being the southern end of the Great Migration. Every year over 1.5 million animals, mostly wildebeest but also zebra and Thompson's gazelle, follow their instincts and move through the western corridor on their 1000 kilometre journey to the fresh grazing of the Masai Mara. Predators pick off the weak, the laggardly and the young and crocodiles feast as the vast herd crosses the rivers but they continue their trek, as they have done since time immemorial. This is one of the earth's great sights - but it is by no means all the Serengeti has to offer. The vast, flat central plains, made fertile by the ashes of the none volcanos of the Ngongoro highlands, are places of huge skies, of shimmering heat hazes, yet also of delicate wild flowers blooming after the rains. The savannah, sprinkled with Acacia Tortilis, has majestic termite mounds and rock formations called kopjes which make great vantage points for predators. The lion are abundant, the leopard are plentiful (yet still secretive) and black rhino and cheetah both breed here. There are more than 500 species of bird and, interestingly, 100 sub-species of dung beetle - a sign of a varied animal population! Ndutu, in the south, has small lakes where you may see hippo and water birds. Perhaps one of the best ways to see the Serengeti is a hot air balloon ride when, in the cool of the early morning, you may admire the grandeur, the vastness and the stunning landscape.